Freedom and Flourishing: Which of the western democracies will be able to cope with future growth in government health spending? Which of the western democracies will be able to cope with future growth in government health spending? 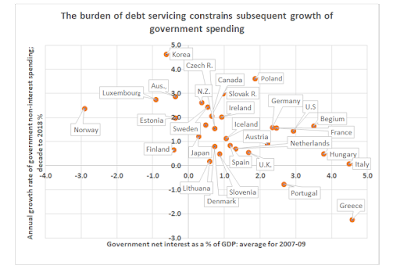 The chart shows that those OECD countries with the greatest burden of debt servicing a decade ago have subsequently had the lowest growth in government spending. It isn’t hard to understand how that might happen when we think about the consequences of accumulating debt in our personal lives. If we go heavily into debt, a higher proportion of our income must be devoted to servicing debt and less is available for other spending. Our creditors are likely to be reluctant to extend further credit if they become concerned about our ability to service existing debt. At a national level, there are additional complications including the potential for governments to inflate away the real value of debt denominated in local currency and possible ‘bailouts’ by the IMF and ECU. Nevertheless, governments that become poor credit risks must pay a higher risk premium than is normal for government bonds, in order to obtain access to additional credit. There is evidence that rising government debt to GDP ratios are associated with lower economic growth, which in turn, leads to lower growth in government revenue. That obviously has potential to further squeeze non-interest government spending. The results of a recent study published by the Dallas Fed (‘Rising Public Debt to GDP Can Harm Economic Growth’, by Alexander Chudik, Kamiar Mohaddes, M. Hashem Pesaran and Mehdi Raissi) suggest that over the longer term persistent accumulation in debt as a percentage of GDP at an annual rate of 3 percent is eventually associated with annual GDP growth outcomes that are 0.2 to 0.3 percentage points lower on average. To put that in perspective, the average growth rate of OECD countries has been about 1.5 percent per annum over the last decade. Causality could run both ways. Lower GDP growth can lead to higher debt levels, which, in turn, can lead to lower economic growth. 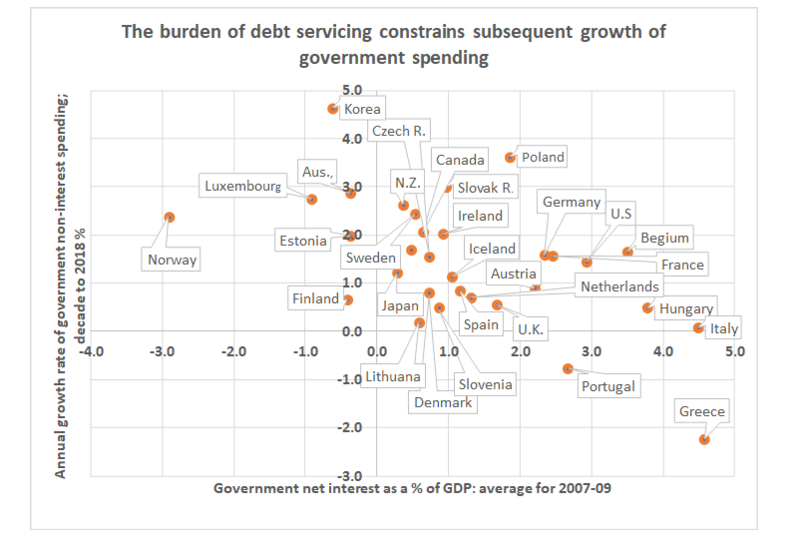 You might be wondering why I think the chart shown above has much relevance for western democracies other than Greece, Italy and Portugal, which had high government debt servicing burdens a decade ago. The relevance stems partly from the continued increase in government debt as a percentage of GDP in most OECD countries over the last decade. On average, net financial liabilities of those countries have risen by around 23 percentage points of GDP over the last decade to around 67% of GDP in 2018. Those looking for reasons to be complacent can obtain some reassurance from low world interest rates. With interest rates paid by governments lower than the rate of economic growth in most OECD countries, debt servicing is not yet a widespread problem. At current interest rates, it would be possible for the debt to GDP ratio to decline in most OECD countries, even if governments pay interest on their debts by borrowing additional funds. How likely is it that world interest rates will remain at low levels over the next few decades? In their recent OECD paper, The Long View: Scenarios for the World Economy to 2060, Yvan Guillemette and David Turner suggest that relatively low growth in investment is likely to keep downward pressure on world interest rates, even though population ageing is likely to reduce savings rates. Nevertheless, they note evidence that reversals of the relationship between world interest rates and economic growth rates have been “fairly common” in the past. They warn that a sustained rise in interest rates relative to growth “could eventually make large debt stocks costly to service and unsustainable”. Their projections suggest that some decline in economic growth rates is likely to occur in most parts of the world over the next 40 years. My concerns about the potential for debt stocks to become costly to service in many more OECD countries are related to the implications for government spending of the ongoing increase in the proportion of elderly people in the populations of these countries. The implications of demographic change have been much talked about over the last few years, but the magnitude of the likely impact on government spending doesn’t yet seem to be widely appreciated. The study by Guillemette and Turner projects an increase in annual public health and pension spending of about 5 percentage points of GDP for the median OECD country between 2018 and 2060. The bulk of that increase is for public health spending, which is projected to continue to be pushed up by technological change and government health policies, as well as demographic factors. The methodology used by Guillemette and Turner produces estimates of the increase in the revenue to GDP ratio needed to pay for projected government spending increases without any further increase in debt to GDP ratios. An increase in revenue as a percentage of GDP of 6.5 percentage points of GDP is projected to be required for the median OECD country over the period to 2060. A much larger increase is projected to be required in some countries. For example, the required increase in revenue for the U.S. is projected to be 10 percentage points of GDP. I think the baseline scenario presented by Guillemette and Turner is too optimistic because their modelling takes no account of the disincentive effects of higher taxation on GDP growth. The possible magnitude of this excess burden of taxation is discussed in an Australian context in an article posted on this blog a few years ago. Leaving that aside, it seems to me that ongoing increases in debt to GDP ratios - and hence substantial increases in government interest payments as a percentage of GDP - are a much more likely outcome in most OECD countries than tax increases in the years ahead. In those countries where debt servicing isn’t yet a problem, there seems likely to be much less political opposition to further increases in public debt than to tax increases. That suggests to me that over the next few decades most OECD countries are likely to increase their debt to GDP ratios until debt servicing does become a more widespread problem. Guillemette and Turner present scenarios that would require smaller increases in government revenues than in the baseline (no-change) policy scenario, but those scenarios involve health policy and labour market reforms that have been difficult to achieve in the past. I don’t think we can expect voters to be any more supportive of reforms that could damage their short-term interests than they have been in the past. The best we can hope for is that when they see the writing on the wall, a sufficient proportion of voters in most countries will be supportive of political parties proposing economic reforms, rather than waiting until they are imposed by creditors (or institutions such as the ECB and IMF). In 2013 I wrote something here contrasting the responses of Sweden and Greece to fiscal crises, that illustrates the choices available. The transition may be traumatic, but it seems likely that technological advances will provide options superior to government provision of many services in coming decades. What I have in mind particularly is the potential for blockchain to enhance opportunities to seek mutual benefit in voluntary cooperative enterprises, as previously discussed on this blog. That may create potential for functions to be transferred from the public sector to cooperative enterprises that can perform the functions more efficiently. During the next few decades most of the western democracies seem likely to experience ongoing difficulty in coping with the additional government spending required to meet the health needs of the elderly. The most likely outcome seems to me to be an increase in debt to GDP ratios that will result in more widespread debt servicing problems. It seems inevitable that debt servicing problems will lead to a lower rate of growth in government spending in many OECD countries, possibly accompanied by the transfer of some functions to voluntary cooperative enterprises. That leaves the difficult question of identifying which of the western democracies are more likely to be able to implement those reforms through normal democratic processes in order to avoid having austerity imposed upon them by creditors and international agencies. I do wonder a little about your arguments here, Winton. As a starting point, an aging population means less spending on certain functions including education and children's health, so you get a compositional shift in spending. Then, too, countries that have already invested in universal health systems are, I think, in a better position to manage the incremental increase in spend because of lower marginal costs. Consider the case of the US with its pattern of over and under investment in health services. The US already spends a higher proportion of its GDP on health services than, say, Australia, but also has a higher proportion of its population who lack basic cover. That implies that the US will need relatively more spend to cope with an increase in the number of older people. The original argument put in the first Australian inter-generational report (May 2002) was that population aging created a double whammy as workforce growth stopped with production and revenue effects while the net cost of servicing an older population went up. Within this mix, Government debt and debt servicing imposed another constraint in responding to the aging challenge. Increases in productivity, cuts in Government spending, were required, if the problems of an aging population were to be managed. The outcomes in the almost 17 years since that report have been different from those projected. This is not a criticism. The value of reports such as these is that they provide a benchmark against which the expected to happen can be compared to the what happened, the variances analysed. Several things happened. Immigration has been higher than projected. More importantly, I think, the proportion of the older workforce staying in some form of employment has been greater than expected. At the same time, the proportion of the workforce that is unemployed/underemployed has increased, especially among the younger age cohorts, creating a growing workforce pool that could be employed. To my mind, Japan is the canary in the coal mine for population aging, in part because of that country's opposition to immigration. The Japanese population peaked at 128 million in 2010 and is now in decline, projected to fall to 100 million by 2050. The proportion of those over 65 has increased from 7.1% in 1970 to 26% in 2014 and could reach 40% by 2060. In Australia, the proportion over 65 has risen from 9% in 1977 to c15% on 2017 and is projected to reach 22% by 2057. So Japan is now where we might be in some time after 2057. I think my point in all this is that the comparative statics you use does provide an an indication on one variable, but its only a small part of the story. The OECD projections assume that government spending on items other than health and pensions will be maintained in real terms on a per capita basis. You may be right that education spending will decline if there are fewer children, but teachers’ unions may have other ideas. Overall, given that some increase in per capita GDP is projected, maintaining spending constant in real terms seems to me to be very conservative. The health spending component of the projected increase in government spending for the U.S. doesn’t seem exceptionally large relative to that of other OECD countries. The exceptional element for the U.S. is “other factors”. The authors of the report tell us that “captures the initial gap between primary revenue and the level that would stabilize the debt-to-GDP, but also changes in GDP growth rates over the projection period”. Sorry, if that is as clear as mud! These reports get a fair amount of professional scrutiny before they are published, so I expect that aspect of the methodology is defensible. Your point about Australia’s first intergenerational report is taken. Things rarely turn out as expected, but it is still worthwhile attempting to anticipate where problems might arise. The OECD projections to 2060 seem to me to be fairly optimistic for reasons I have noted. Apart from that there seem to me to be large down-side risks around at the moment, including the potential for international trade to be more severely disrupted. On the other hand, as a technological optimist, it does seem possible to me that productivity growth will be a higher than projected. In my view, Japan doesn’t qualify as the canary in the coal mine because its interest rates on government debt are exceptionally low, despite a relatively high government debt to GDP ratio. I understand that is because of a high savings rate and debt being denominated in domestic currency. The accumulation of government debt in Japan seems to have been more attributable to macro policy than population aging. I get the impression that the Japanese system of health care for the elderly relies more heavily on family and voluntary community involvement than most other OECD countries. There may be potential for other countries to achieve better outcomes at lower cost by moving in that direction, but I don’t expect much headway to be made in reducing the growth of government health spending before debt servicing becomes a problem. Perhaps the OECD report should have focused to a greater extent on ongoing pressures for increases in government spending in areas other than health. If the future is anything like the past, however, we can be sure that there will be ongoing pressures for government spending increases in many different policy areas accompanied by ongoing resistance to tax increases. In the past, most democratic governments have been able to contain such pressures before debt servicing problems emerged. The new factor in the political environment of many democratic countries is that economic reform is now much more difficult to achieve than it was 30 to 40 years ago. Hi Winton. I need to read the OECD paper before commenting! That OECD paper is a reasonably complicated exercise with some fairly standard modelling assumptions. A whole lot of issues arise, but dealing with Japan first. Japanese government debt was 254% of GDP in 2018 up from 215.8% in 2010. The minimum was 51% in 1980. The rise reflects reactions to the stock market crash of the 1980s and attempts to reflate the economy including 15 years of quantitative easing along with very low long term interest rates. As you note, Japan has had I think high savings rates for a long time. Since the 1980s the country has run a balance of payments surplus. Low interest rates at home have encouraged overseas investment to the point that inflows of interest and dividends are a major contributor to the surplus. It's a bit like Britain was before its overseas investments were badly damaged by two world wars. Japan has a dual old age pension system. https://www.tokyo-icc.jp/guide_eng/life/01.html. Phew. I just wanted to be certain of all those facts. Turning now to the OECD modelling, I was interested to discover that Australia was underspending on R&D, infrastructure and labour market programs and needed to increase spend there. An increase in taxation to fund it would pay dividends in terms of future living standards while holding debt ratios steady. In terms of the increase in the tax share necessary to account for the effects of aging in the base line case projects primary revenue as percentage of GDP needs to increase by 6½ percentage points of GDP from 2018 to 2060 in the median OECD country. Leaving aside other assumptions for the moment, a key assumption is that Government debt levels stabilise at present levels. This means that countries presently running budget deficits such as the US have to recover those. With expenditure on all other items maintained in real per capita terms, aging costs become an important variable. Thus Australia needs a projected increase of 5% almost totally due to health costs while the US is over 10% of which health costs are about b.5%. There are some compositional issues here that I am ignoring. With health cost containment and labour market reform, the required increase in primary revenue as a % of GDP by 2060 is projected to be perhaps 3%, a bit over 2$ for Australia including additional spend on labour market programs and family support support of around 1% of GDP. It's a bit difficult to know what all this means. The existing debt levels as a % of GP are essentially pegged, which implies some increase in borrowing. The base health costs appear to be taken as a fixed thing. The projected income increases depend on various assumptions. The countries covered exclude most of Africa where populations are growing fastest. The assumption about maintaining real per capita spend would appear to imply that countries like Japan and Russia will be reducing spend as populations fall. They may be able to do so in some areas, but not in others. And then there are, as you note, interest rate uncertainties. There are a number of bits in the analysis that are interesting. For example, if as seems to be the case the desire to save exceeds the desire to invest, then the availability of liquid funds has limited impact on investment. On the surface, increased government spend would then not crowd out private investment but may actually increase returns and private sector investment. Then, too, there is the assessment of Australia's vulnerability to trade wars. In all this, one of the issues is the point at which aging costs start to fall as the number of older people decline. And then there is the question of migrant flows. I have spent far too much time wandering around these issues. Still, it is interesting. Jim, I will try to respond tomorrow - watching tennis tonight, an outing with grandchildren tomorrow morning. Jim, I am a Federerer fan, but it was pleasing to see him beaten last night by a young Greek. Today we went to the Australian Reptile Park on the central coast. They do a good job of combining education with enterprise entertainment. It was a tiring day, but I enjoyed it more than I had expected. I learned something about the Japanese pension system from your comments on Japan. It looks to me like compulsory superannuation, with the government making contributions for those unable to afford to do so. Your explanation helps me to understand the reasons for the projected growth in tax to GDP in the U.S. if they are to hold debt to GDP constant they need offset the current budget deficit. The OECD people are keen on labour market programs. I haven’t recently looked at the evidence of how well they work. I hope the OECD is right. It is a few years since I thought seriously about crowding out. If we start from a simple model of a small country iborrowing in the world capital market, there can be no crowding out unless government borrowing affects the items on which the private sector can borrow. As far as I can see at the moment, that doesn’t happen until the government has to pay a risk premium on its borrowing. I am too tired to think about the liquidity this evening, apart from my desire for a second glass of wine. I am enjoying a fine bottle of Petite Sarah. The unhelpfulness of the predictive typing on my iPad is testing my patience. I typed “Petite Sirah”. It is worse than I thought. I had intended to write: “there can be no crowding out unless government borrowing affects the terms on which the private sector can borrow”. Your point about savings, investment and crowding out makes sense for an economy like Japan. International capital flows obviously don’t equate interest rates all over the world. As I see it, crowding out becomes a major problem when debt servicing is perceived as likely to become a problem, and the market demands a substantial risk premium on further government borrowing. When that happens private investors have reason to be concerned that higher taxes will eventually reduce returns on their investments. That glass of wine sounds very good, Winton, better than my cask red! And it sounds like a fun day. On crowding out, in very simple terms (I need to keep things simple) the traditional argument is that if Government increases spend that money crowds out private sector spend. Part of your traditional argument on taxation levels is that lower taxes increase the incentive for the private sector to invest. So higher spend crowds out directly plus lowers investment incentives through through higher taxation than would otherwise be the case. Globally, we seem to be in a position where the business opportunities to justify the higher capital spend are just not there. The high tech companies are an interesting case study - https://www.arnnet.com.au/slideshow/525406/pictures-top-tech-hoarders-15-companies-huge-cash-piles/. Higher profits go to share buy backs or higher dividends while investment remains down. Oz companies have been doing something similar. Google et al are interesting when we think that Australian private sector annual capex in total is about$A110 million. But going back to your original point, I agree that high levels of Government debt are a problem especially when combined with SOE and private debt (China) or high household debt. That problem become more acute should interest rates rise which I think is still likely. The issue here is real interest rates, of course. I also agree that the OECD modelling does provide one measure of the costs of aging, if an imperfect one. I wonder, though, about the assumptions involved.